Enter Villa Hansa via a glamorous foliage-fringed staircase leading to a stunning Javanese joglo living space with a guest kitchen and bar. 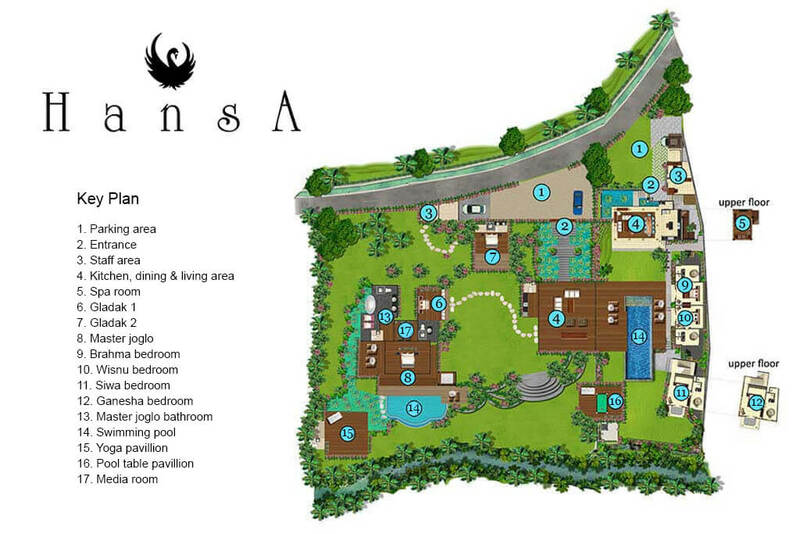 To the left is the pool, from which sun decks and gardens lead to an open-sided dining pavilion. Upstairs behind a garden is a massage room. Four luxurious bedrooms border the pool and beyond these is the barbecue balé. The master suite, movie room and adjoining timber gladak bedroom lie to one side of the estate, with the yoga studio below and another gladak bedroom at the rear. At Villa Hansa’s heart is a repurposed antique timber joglo with floor-to-ceiling windows and cool air conditioning. A deep cushioned sofa and soft chairs are positioned below an ornately carved timber tampung sari (the heavily stepped and sculpted centre of the joglo ceiling) while a two-metre-long table hewn from a single piece of wood is housed in a cool corner. A guest kitchen and service counter lies behind a bar that has comfortable stool seating for four people. Antiques and rare artefacts, including a beautiful old china cabinet and rattan rooster cages, give this room a sleek and polished ambiance. Overlooking Villa Hansa’s swimming pool is a casual open-fronted, fan-cooled pavilion that is perfect for relaxed dining, board games and simply chilling. The main kitchen, where staff create gourmet meals and brew delicious ginger tea, is in this pavilion, which is bordered by gardens – both water and flowering - and is decorated with quirky pieces, including a series of chicken statues. The dining table here seats 12 people and several low-slung chairs provide a comfy base from which to relax and watch over pool shenanigans. The polished timber floors are bordered with white stone and the vibe is shabby chic. Villa Hansa’s 18-metre swimming pool is deep at one end and very shallow at the other, making it perfect for morning laps, a spot of diving or a place for little people to splash. Elegant daybeds and sun loungers surround the pool - some under the shade of umbrellas. A fresh water shower, carved in the image of a Hindu goddess, is recessed into the garden borders. A large balé, facing the river and rice fields at the far side of the gardens, makes a great space for lazy barbecue lunches interspersed by cooling dips in the pool and friendly tournaments at the full size pool table. Villa Hansa’s seven luxurious bedrooms are housed beneath elegant ironwood-shingle roofs with ceilings of exposed beams and woven rattan. Ensuite bathrooms feature private walled garden spaces that epitomise chic tropical elan. From large windows views of lush green landscapes predominate. Four of the villa’s guest bedrooms are named after the Hindu gods Brahma, Wisnu, Siwa and Ganesha; all featuring netted four-poster king-size beds and cooled by fans and air conditioning. The master suite offers unrivalled luxury and privacy with a California king-size bed positioned below a rare 400-year old joglo carving. Bedside lighting controls are integrated into the teak bedframe and café-style seating is provided at two tables. A sundeck leads to a 12-metre infinity pool and wraps around to a secluded walled courtyard. The bathroom features a huge sunken bath surrounded by a fish-filled pond. A private television room lies behind the master suite. This beautifully earthy antique Indonesian building makes an ideal kids bedroom. The room features timber shuttered windows and slatted walls plus a sweet veranda. A wonderfully preserved four-poster queen-size daybed makes a gorgeous centrepiece to the room, which also has an antique wardrobe, desk and chair plus a cushioned wooden bench seat. The ensuite bathroom is fitted with a rectangular volcanic stone bathtub, unique hand crafted tiles, separate shower and vanity. It is connected to the master suite via the television room. This is another wonderful example of a preserved traditional Indonesian timber house with a single daybed making it particularly suitable for kids, teens or friends sharing. This gladak is located on grassy lawns and surrounded by mature gardens. The ensuite bathroom has an outdoor shower. This building has two bedrooms – Siwa on the ground floor and Ganesha upstairs. Both are furnished with netted four-poster king-size beds and feature dressing rooms and sitting areas. Siwa boasts a small private terrace overlooking the tropical gardens and river, while the Ganesha suite has a shockingly green outlook from large windows. Both ensuites are fitted with round travertine baths and indoor showers. The Wisnu and Brahma suites both overlook the pool and have comfortable king-size four-poster beds and separate dressing rooms. Interiors here are more hip than traditional, and have a chilled vibe. Both rooms are furnished with sofas and feature interesting statuary. Ensuites are fitted with circular tubs and the private garden in Wisnu’s bathroom is an extraordinary riot of tropical flowers, including heliconia, torch ginger and an ancient frangipani tree.